Every person’s life story is a precious and unique gift. What better place to encourage this than at your next family get together or reunion? No matter their age, their life deserves to be remembered and shared with others. 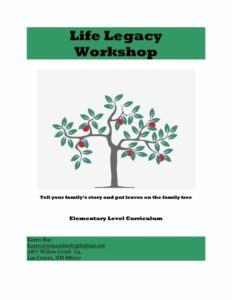 Whether the kids in your group are elementary age or mid-high and high school, having these on hand will be sure to help start the conversations as they mix among the in-laws, outlaws and other relatives looking for a story. Perhaps you can encourage them to be reporters for a day? The easy to use workbooks are developed specifically to encourage inter-generational story telling. They encourage learning, fun and meaningful conversations and have been used in memoir classes for children and young adults. Even adults can implement these ideas with their family members young and old. Help the younger folks in your family be aware of the people and events that have impacted their lives. Encourage them to see God’s direction in their life events, no matter how old they are. 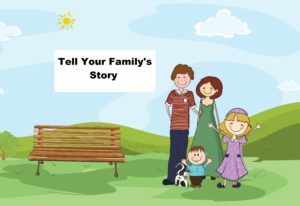 Inspiring families to share their stories and their histories fosters richness in their life experience. What a legacy to leave to the next generation! Our online shop is under construction and will be ready for orders soon! In the meantime you can contact us directly. To order copies of both the elementary and the mid-high/high school workbooks for your next family event or class. Yesterday was National Collector Car Appreciation Day. I just love vintage automobiles—the look and the stories behind them, not the work that goes into restoring them. If your budget, like mine, doesn’t allow for collecting vintage cars, today is National Mac and Cheese Day. It would be great to hear some of your automobile stories—whether it’s first cars, vintage cars or memorable automobiles you have known. 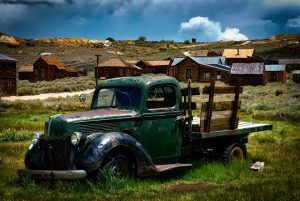 Connect with me on FaceBook and post a photo of your favorite old car. 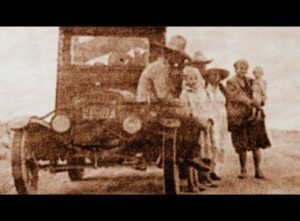 “We had no automobile or horses and wagon. We walked. We couldn’t buy a car until about two years later and that was a Model “T” Ford. Then, my dad caught a freight train with a lot more destitute men for California. But he got off in Phoenix and got a job in Scottsdale in the orange and cotton farms. He found a job for about 10 cents a hour, but made enough to send for us. He had saved up less than $5. After getting a little money from Dad, we three families, ours and two other families who were our friends, got a model “T” truck and joined the “grapes of wrath” across country. We all piled on the truck, packed with just mattresses and clothes and headed to Arizona and California. I was six or seven years old. We stacked our mattresses on the truck and sat on top down Highway 66 and we got off in Scottsdale, Arizona. We found an old abandoned station and there was no gas but it was just a place for us to stay that night. So, we stopped and spread our stuff out. I remember it was hot on that long drive. We ate canned beans, we didn’t eat much of that, we didn’t eat much…We didn’t drive very fast; the trip was a week or more. The old model T was probably only doing 25-30 miles per hour, 40 at the very most. It was just the 4 of us kids, the rest of them were adults. And that, ladies and gentlemen…is what we call grit!